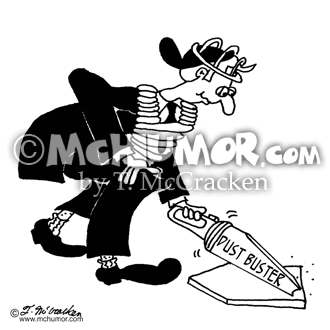 Baseball Cartoon 5388: An umpire with a Dust Buster® sweeps home plate. 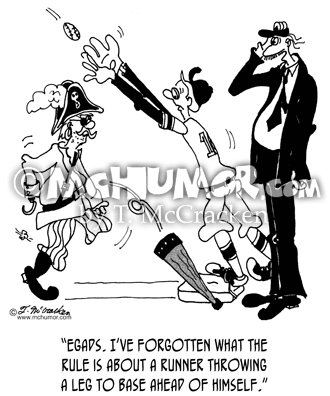 Pirate Cartoon 5474: About a pirate who's thrown his peg leg to first base an umpire says, "Egads. I’ve forgotten what the rule is about a runner throwing a leg to base ahead of himself." 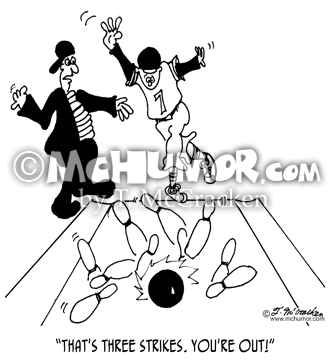 Bowling Cartoon 6672: An umpire saying to a baseball player throwing a bowling ball, "That's three strikes. You're Out!" 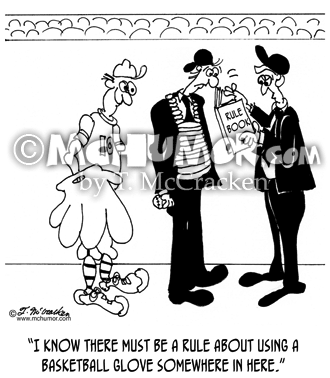 Baseball Cartoon 6640: An umpire standing next to a player with a humongous glove flips through a book says, "I know there must be a rule about using a basketball glove somewhere in here." 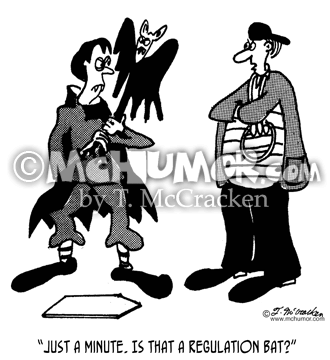 Baseball Cartoon 5035: An umpire saying to a vampire baseball player ready to use a bat (the flying animal kind) as a baseball bat, "Just a minute. 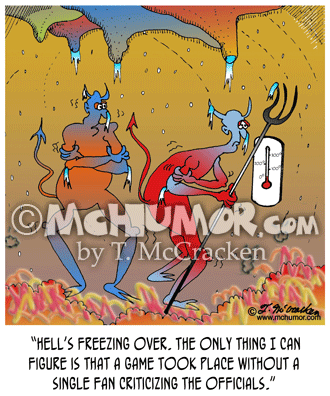 Is that a regulation bat?" 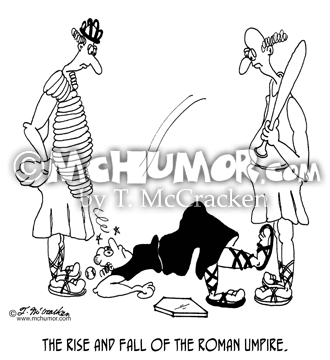 Baseball Cartoon 5389: "The rise and fall of the Roman umpire." Ball players in togas look at an umpire who's been hit and knocked out by a ball. 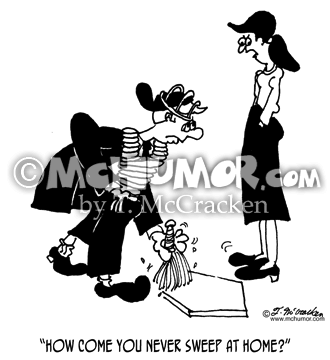 Baseball Cartoon 6746: A woman asking an umpire sweeping home plate, "How come you never sweep at home?" 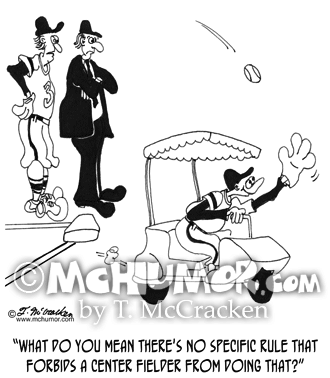 Baseball Cartoon 5088: A baseball player looking at another driving a golf cart to chase a fly ball asks an umpire, "What do you mean there's no specific rule that forbids a center fielder from doing that?" 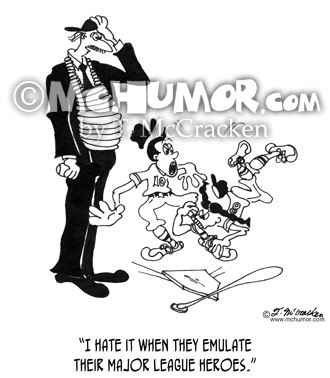 Baseball Cartoon 5449: An umpire watching little league baseball players fight says, "I hate it when they emulate their major league heroes."